You may have noticed the leaked pictures of the new black X-Wing that will be debuting in Episode VII (probably). Rampant speculation holds that it might be the film debut of the "StealthX" X-wing - a stealth starfighter built to be all but undetectable by even the most sophisticated sensor arrays. Undetectable, that is, as long as it maintains comm silence. 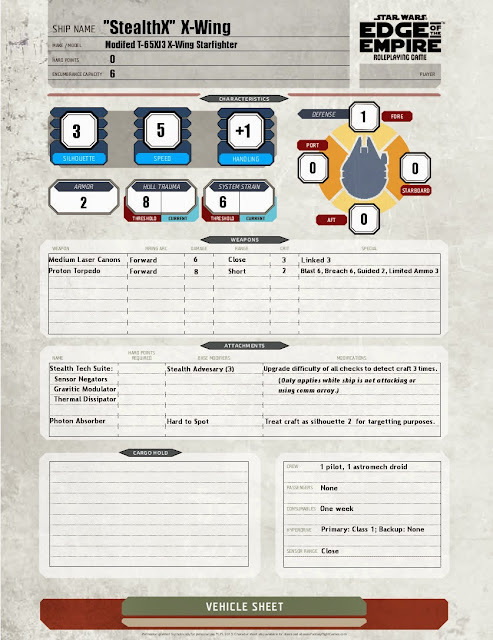 Whether or not this black X-wing ends up being the famed stealth X-wing or not, it can still make a debut in your game using the ready-to-play game stats below. The "StealthX" is built on the standard X-wing chassis, with a few key alterations. The Stealth Tech Suite is a combination of sensor negators, gravitic modulators, and thermal dissipators, that make it practically invisible to sensor arrays, and effectively granting the craft cloaking. This combination of cutting edge technology grants the X-wing a unique attribute "Stealth Adversary". Any vehicle with the Stealth Adversary attribute upgrades all difficulty checks to detect the craft X number of times. This applies to all sensor checks, as well as visual scanning - affecting any relevant Computer, Perception or Vigilance skill check. Of course, the ship is only stealthy so long as it stays quiet. Any use of the ships comm system or weapons negates the Stealth Adversary attribute until it can get out of sight again. The StealthX's distinctive black paint job also aids the starfighter. Made with unique photo absorbing properties, the StealthX seems to vanish into the starry void of space. As a result it gains the "Hard to Spot" attribute. A craft with Hard to Spot is treated as being one silhouette size smaller than normal, for targeting purposes. While TIE fighters and other small craft likely to be in close range won't be effected by this, it does make the StealthX significantly harder to target for capitol ships, or planetary defense lasers. There's a heavy cost to be paid in exchange for loading an X-wing up with so much stealth technology - namely a serious reduction in defensive capabilities. The black X-wing features weaker shields, less armor, and lower strain and hull trauma thresholds as a result of cramming in so many additional systems. The starfighter also loses it's 1 hard point, giving it even less customization than a standard X-wing.